Another virtual class with DG SCIC ! LINCS held a virtual class in cooperation with the Directorate General for Interpretation on Friday 17th November. This EU institution, familiarly known as SCIC, runs all the interpreting services of the EU Commission, and cooperates with universities which specialize in conference interpreting. LINCS managed to secure this prestigious type of cooperation for the 2nd year running, following a first virtual class held last June with the previous Honours and MSc cohorts. Fernando Leitão, Head of the E-learning sector for SCIC, explained to the 19 UG and PG students present that the “main purpose [of a virtual class] is to supplement guidance you are getting from your teachers”. This virtual class was also a first, as the Brussels-based SCIC team was joined by a team of interpreters from the European Court of Justice, based in Luxembourg. 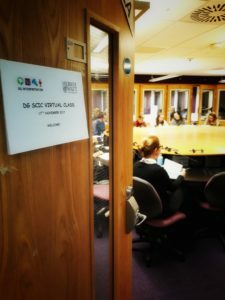 Thanks to the support of Heriot-Watt’s AV team, a three-way connection was set up via Polycom. 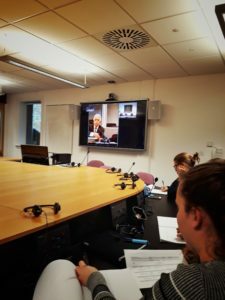 As a result, students based in Edinburgh were able to attend a virtual class jointly run from two other European cities, and two different EU institutions, thus enjoying a truly international class. Students were equally delighted and daunted to have an opportunity to try their consecutive interpreting skills on speeches delivered by EU interpreters. Topics were sent a couple of days in advance by the coordinator for this virtual class, Clara Baruffati (herself a graduated from our MSc in conference interpreting, currently doing a stage with SCIC), and students were able to research topics such as the butter crisis in France, the impact of technologies on paper-books, and how nuclear science can tackle disease-spreading insects. While our Honours year students started learning note-taking skills and practicing consecutive interpreting during their second year, MSc students only started to acquire this set of very specific skills a couple of months ago, so tackling speeches 5 to 8 minutes long presented a real test of their abilities. But despite the pressure of working with such prestigious teachers, who are such inspirational role models for aspiring conference interpreters, students dealt with the tasks well, receiving comments such as “impressive performance” in some cases. So what advice did they take on board from the experience? Firstly, “you’ve got to be prepared to roll with everything”, according to Kevin McCarthy, EU interpreter and trainer from the English language unit. Secondly, work on communication skills and confidence: “your credibility is everything”, so mastering signs of stress is crucial, as are communication skills. Students were also encouraged to pay special attention to the coherence of the speech, and to ensure that they use the opportunity to ask a few questions to elicit every crucial piece of information from the speakers. This very thorough session, during which students received not only specific feedback on their performances, but also valuable professional advice, left students rearing for more similar challenges, and determined to take all the advice on board to practise and progress further. Following this exciting experience, students are hoping to get further opportunities to receive guidance from EU interpreters, and they are also looking forward to the coming – award-winning- annual multilingual debate, which will take place on March 21st. On that occasion, they will be applying their simultaneous interpreting skills to facilitate debates between the members of a multilingual panel, an audience of over 400 in the James Watt Conference Centre, and a wider online audience, since the two debates of the day will be streaming live online. Follow us on Twitter @HW_LifeinLINCS and @heriotwatt_soss for updates on #MLD2018. MacFarlane Prize 2017 for Dr Emma Hill ! LINCS and IRC graduate Dr Emma Hill has won the prestigious 2017 MacFarlane Prize for the most outstanding contribution to the research of the University. Emma (pictured here with her supervisors, Prof. Máiréad Nic Craith and Dr Katerina Strani), is the first ever recipient of the prize from any department in the School of Social Sciences. Dr Emma Hill’s thesis “Somali voices in Glasgow: Who speaks? Who listens?” makes an outstanding contribution to knowledge in the ethnographic study of refugees in society. It focuses on the concept of ‘voice’ and researches the multiple ‘voices’ of Somali communities in Glasgow. Her work makes a range of original contributions – from the social scientific fieldwork descriptions of a community during a period of political upheaval in Scotland to the care in presenting, questioning and decolonising the concept of ‘voice’. Congratulations Dr Emma Hill !!! !